and crank this thing up!!! The first new album by The Cars in 24 years sounds new and fresh, retro and classic. It’s like a vintage souped-up 1959 Cadillac with shiny new paint and brand new motor. It’s got huge jets and fins, lots of chrome, leather seats and a wonderful hood ornament – and it rides like a dream! It’s hard to believe that The Cars never had a number one hit. At least ten of their perfect pop masterpieces cracked the Top 40 in the U.S. charts, but only one made the Top 10 (‘Shake It Up’ hit No. 4 in 1981). The album’s title, Move Like This is a pun on the band’s tendency to not move around very much onstage. This disc is full of hooks, driving beats and cool melodies. 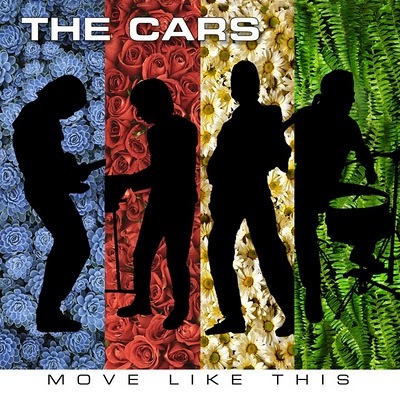 The Cars’ signature synth sounds are timeless. They don’t sound dated, as most 80s synths do, because the Cars’ electronic sounds were always more ‘futuristic’. The opener, ‘Blue Tip’ is the archetypal Cars blueprint. It kicks you right into high gear. The first single, ‘Sad Song’ is the antithesis of its title; upbeat and driving with a great hook, reminiscent of their own ‘Let’s Go’ (1979). Besides the band’s own familiar style which resounded through recent decades, there is a retro 60s and 70s feel to some of the songs. ‘Keep On Knockin’ hails back to beat of the Velvet Underground’s ‘I’m Waiting For The Man’ and adds an ‘American Woman’ style guitar solo. ‘Free’ gives a nod to The Who’s ‘I Can’t Explain’ power chords, and ‘Soon’ could have been a Cheap Trick ballad. ‘Drag On Forever’ hints that the album might have been produced by John Cale, with its plodding beat and sleigh bells (which Cale intuitively added to The Stooges’ ‘I Wanna Be Your Dog’, and also the Velvets’ ‘Venus In Furs’). The album was produced by Jacknife Lee (5 songs), and the rest by the band themselves. The only incongruous reference is U2’s ‘One Love’ resounding in ‘Take Another Look’. Benjamin Orr, the Cars’ bassist (who shared vocals with Ocasek and actually sang many of their biggest hits) died of pancreatic cancer in 2000. But the rest of the band is back in fine form, and they haven’t missed a beat! Rather than replace Benjamin, the bass parts were programmed/performed by Greg Hawkes and Jacknife Lee, with Hawkes playing a bass once owned by Orr. This is an amazing comeback by a pure, slick and beloved pop band – and it rocks! You CAN go home again! The Best Buy version has three extras; 2 of which are non lp tracks. ‘Hits Me’ (demo), ‘One By One’ and the trippy ‘Rocket USA’, (a cover version of the 1977 Suicide track). It also contains two videos; ‘Blue Tip’ & ‘Sad Song’.